Mark Zuckerberg was 12 years old the last time the stock market was this calm. The S&P 500 hasn't suffered a downturn of 5% or more since June 26, 2016. That's 402 calendar days -- the longest streak since May 1996, according to Bespoke Investment Group. It's yet another sign of a hot market. 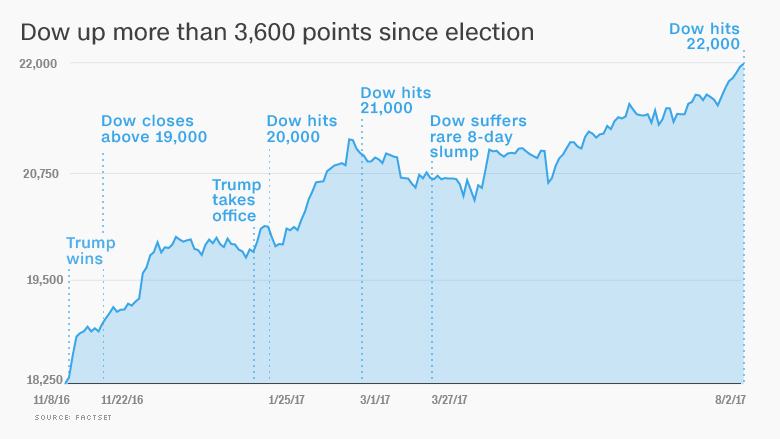 The Dow has climbed more than 3,600 points since President Trump's election, and this week it passed 22,000 for the first time. 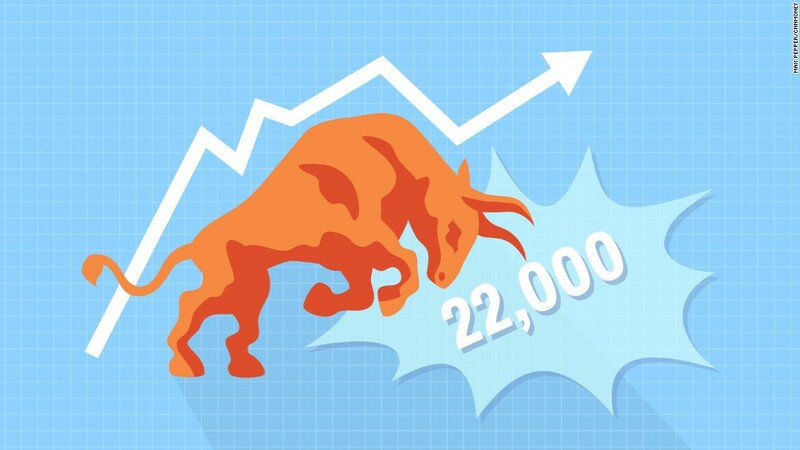 Wall Street has been rocked by only a few single-day sell-offs and no prolonged slumps. The rally has been steady, not just long. The closely watched VIX (VIX) volatility index touched an all-time low last week. The lack of market craziness is a relief to many Americans, but some are wondering whether Wall Street is due for a drop. They worry that the market has become a little too quiet -- especially considering the relentless noise from Washington and global hot spots like North Korea. "Markets are rarely ever this calm for long," Ryan Detrick, senior market strategist at LPL Financial, wrote in a report. Market pullbacks can be healthy, preventing stocks from overheating and allowing investors on the sidelines an opportunity to get in. Kristina Hooper, global market strategist at Invesco, compared this summer's geopolitical events to paper cuts. "Individually, the market can brush them off. But a significant accumulation of paper cuts over a short period of time might cause investors to suffer," Hooper wrote in a recent report. The streak of 402 days without a 5% pullback in the S&P 500 is the seventh longest in history, according to Bespoke Investment Group. No wonder CNNMoney's Fear & Greed index of market sentiment is sitting comfortably in "greed" mode. The S&P 500 would have to go 191 more days without into a downturn -- February of next year -- to break the all-time record, set in 1959. The calendar may be working against Wall Street. August can be a scary month. On one day in August 2015, the Dow plunged 1,000 points, and in August 2011, when America's credit rating was downgraded. An Asian financial crisis hammered the market in August 1997, and the hedge fund Long-Term Capital Management imploded in August 1998. August and September are the only two months to average a stock decline since 1980, according to LPL Financial. This August will have its obstacles. The Trump administration and North Korea are saber-rattling, with U.S.-China relations caught in the middle. Congress needs to raise the debt ceiling to avoid a disastrous default. Treasury Secretary Steven Mnuchin estimates the government can meet its financial commitments for two more months. Wall Street hasn't been spooked by any of this -- so far. "Investors would be wise not to extrapolate this calm," said David Lafferty, chief market strategist at Natisix Global Asset Management. So why is the market so calm? Many analysts believe that extremely low interest rates and bond purchases by global central banks have suppressed market turbulence. The Federal Reserve is raising interest rates, but officials have emphasized they will do this gradually, not to upset the economy or markets. The U.S. economy isn't booming, but it's growing steadily, and the unemployment rate is just 4.4%. Wall Street doesn't fear a recession, nor ultra-fast growth that could force the Fed to end the easy money party. Global growth has also accelerated, led by strength out of Europe. This Goldilocks environment continues to support healthy corporate profits from the likes of Apple (AAPL), McDonald's (MCD), Boeing (BA) and Facebook (FB). All that explains why LPL's Detrick believes investors shouldn't fear the next pullback. "We would use any pullback as an opportunity to add to positions," he said.